LONG ISLAND CITY — Love it or hate it, the 7 train is as quintessentially Queens as The Mets or the Unisphere. A free exhibit opening next week will explore the subway line's impact on the borough since it was built more than a century ago — including before-and-after images of what 7 train neighborhoods looked like in those early years compared to now. "7 Train: Minutes to Midtown" will be on view at the New York Transit Museum's Grand Central Gallery Annex starting Aug. 3, featuring a collection of historical photos, signs and other artifacts that will "celebrate the line’s contributions to the diversity of Queens," organizers said. 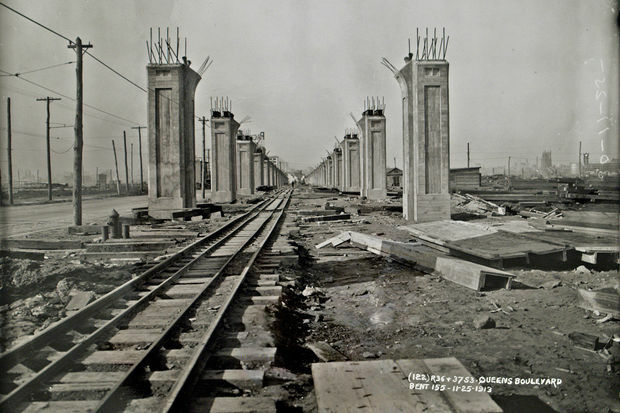 "The story of Queens, and by extension the 7 train, was and continues to be, one of vision," museum Director Concetta Bencivenga said in a statement. "Whether a hundred years ago with the Steinway Tunnel, or right now with Hudson Yards, the 7 train established communities, a neighborhood, and an entire borough, by providing people with access to transportation." Built in 1915, the Interborough Rapid Transit (IRT) Flushing line — originally dubbed the Corona line — was conceived as a way to draw residents from crowded Lower Manhattan into areas further east, according to the museum. The 7 train helped transform Queens from a largely rural area into a series of booming neighborhoods, with the borough's population swelling from 284,000 in 1910 to 1,079,000 in 1930 after the line was built, the museum said. In addition to historical photographs, the exhibit includes old maps, a New York & Long Island City ferry ticket from the late 1800s, station wayfinding signs from the first half of the 20th Century and a Queensboro Bridge Railway token from 1945. The collection will be on display from Aug. 3 to Oct. 29.